Four years ago today, thousands of websites, including Facebook, Google and Yahoo, and hundreds of networks permanently enabled IPv6 in what was called "World IPv6 Launch”. One year before, on June 6, 2011, there had been a 24-hour test in "World IPv6 Day” but by June 6, 2012, IPv6 was enabled permanently for the participating sites and networks. One of the many IPv6 statistics sites many of us have watched since that time has been Google's statistics. It tracks the "percentage of users that access Google over IPv6” and has been showing that reliably over many years now. 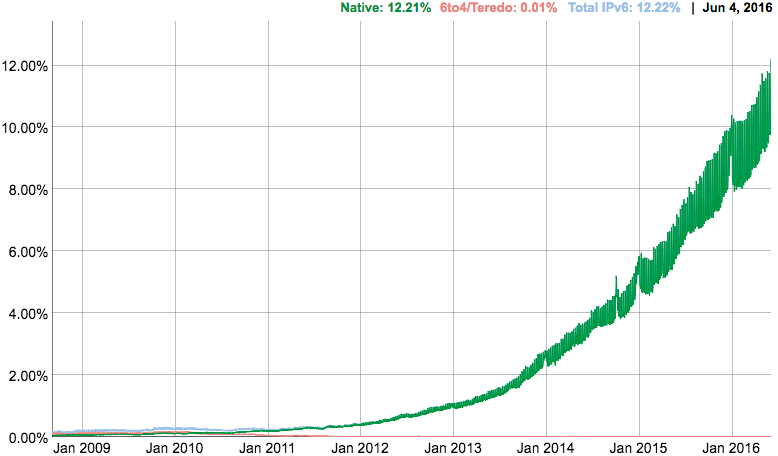 Back in June 2012, the global percentage of users connecting over IPv6 was under 1%. In fact, that percentage wouldn't cross 1% consistently until the end of 2012 ... but in the 3.5 years since, the global percentage has climbed and climbed until just this past weekend it hit 12%! Now, if you select the "Per-Country Statistics" tab you can see that the percentages vary widely around the world. The USA is currently showing 27.44%. Belgium is at 43%. Switzerland is at 26%. Japan at 11% ... and the list goes on. It's fantastic to see this kind of growth curve - and with the IPv6 deployment we're seeing in mobile networks I expect the curve to continue to climb. I look forward to celebrating the fifth "Launchiversary" on June 6, 2017, with even better statistics! I should have also noted that Apple's requirement that as of June 1 all iOS apps must work on IPv6-only networks will also help with the continued rise in IPv6 deployment, if for no other reason than we may see app developers asking their ISPs for IPv6 connectivity. It will also raise awareness of IPv6 in general. Local Time: Wednesday, April 24, 2019 08:58 PM PDT – Page Load: 0.2754 Sec.